OAK ISLAND (WTVD) -- When we ask our viewers to send us photos of the snow, we always get the usual - kids, dogs, porches - but this year, one viewer stepped it up a notch. Oak Island resident Wendy Brumagin was able to capture a beautiful, and what some might consider rare, image of a coyote frolicking in the snow. Brumagin snapped several images Saturday near 48th Street. "I've seen a lot of great pictures and videos during the snowstorm but I think this takes the cake. It's rare to get pictures of coyotes in daylight and even more rare to get them on the beach. 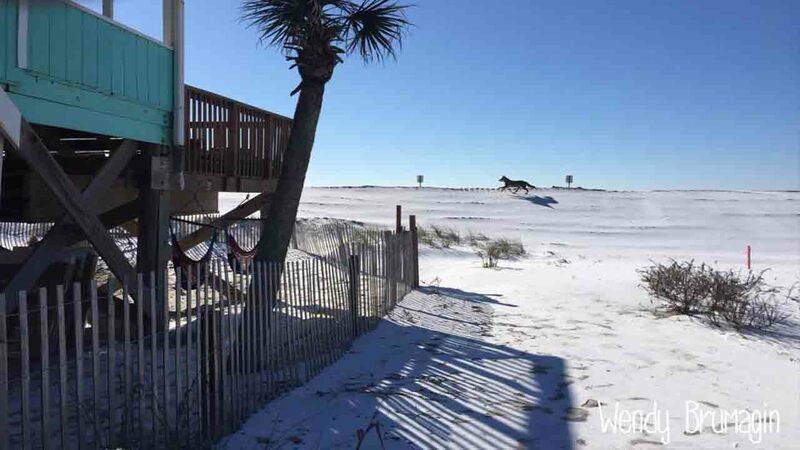 But today Wendy Brumagin who lives on Oak Island in Brunswick County got pictures of a coyote in daylight on a beach that's covered with snow! That has GOT to be very rare." Brumagin pictures were also shared on two other Facebook pages, Beaches of Brunswick County and Oak Island, NC. "On Friday morning between 9 and 10 am I went down to the beach around 47 th and 48th street and I saw what I thought was a German Shepard playing in the snow and I thought how cool and started taking photos but the closer he got I saw it was a coyote he was running along the dune and then he got ahead of me and I got back in my car and drove ahead of him to about 52nd street and stated taking more photos ! My heart was racing with excitement and I was a little nervous too but he never saw me ! He was gliding along the dune and it looked as if he had an injury to his front left paw and he continued along the dune until he was out of my site."